The Minister of Foreign Affairs made evaluations and answered the questions related to Syria. Çavuşoğlu also talked about the Adana Agreement, which was brought forward by Putin during President Erdoğan’s visit to Moscow. Çavuşoğlu, who also informed about the developments regarding the Adana Agreement, gave green light to the Assad regime by saying “Although the ties with the regime were cut, the agreement wasn’t rounded out. If the Syrian government is in front of us when there’s a political solution, it’ll work a lot”. Çavuşoğlu had said before “If Assad wins the elections, everybody has to consider working with him”. As is known, Recep Tayyip Erdoğan had paid an official visit to Russia last Wednesday. 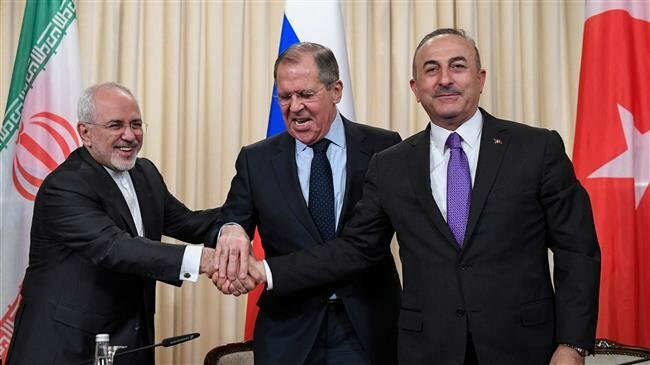 As it is made known publicly, during this visit related to Syria, USA’s decision to withdraw from Syria, the safe zone in the east of the Euphrates River, and the current status in Idlib were put on the table. And after Erdoğan returned to Turkey, he declared that the Adana Agreement, which was made between Turkey and Hafez al-Assad, has been brought to agenda. By the Adana Agreement, which was made between Turkey and Syria in 1998, Syria had accepted the PKK as a terrorist organization and promised Turkey that their activities would not be allowed on Syria’s soil. After this agreement, the PKK-leader, Abdullah Öcalan, was expelled from Syria and caught in Kenia by U.S. intelligence support and brought to Turkey. From this point of view, we could say that America is behind the Adana Agreement, because Hosni Mubarak, USA’s loyal agent and Egypt’s leader at that time, had entered into negotiations with both Hafez al-Assad and Turkey. It wouldn’t be wrong to say that America is behind the fact that the Adana Agreement is brought to agenda again. Even though Putin has reminded President Erdoğan of this, USA is the one who put this issue on the table, which will relieve Turkey politically in the Syria issue. Because by the Adana Agreement, which is brought to agenda for the first time since the begin of the Syrian revolution in 2011, it is aimed that Turkey acknowledges the killer Assad and makes an official contact with the Syrian regime. The Turkish rulers know by heart that America itself wanted the realization of this agreement dated 1998 that day. They also know by heart that the Adana Agreement doesn’t matter at all today from USA’s angle. USA will use this agreement only as a facilitative factor in Assad’s recognition by Turkey. In other words, Turkey will get in contact with the Assad regime by using this agreement. What else could explain the fact that this is put on the table after all these years? What will Turkey request from Syria with this agreement? Will it request the prohibition of the activities of PYD/YPG militants, which are PKK’s Syrian wing, or the handing over of YPG militants to Turkey? It is something to laugh about. We need to ask whether the Adana Agreement did not exist as the Assad regime handed over the east of the Euphrates River to PKK’s Syrian wing PYD-YPG back in 2012? Did the Adana Agreement not exist when the Barzani regime’s Peshmerga forces passed to Kobani by using the borders of Turkey? Did the Adana Agreement not exist when PYD-leader Salih Muslim came to Ankara and met the Foreign Affairs officials? It existed. Then what is violating the Adana Agreement that day, and keeping quiet about the Assad regime’s support to YPG forces and handing over the north area to them and putting the Adana Agreement on the table all about? USA paves the way for the recognition of the Assad regime by Turkey through bringing the Adana Agreement on agenda again, nothing else. Foreign Minister, Mevlüt Çavuşoğlu’s, statements confirm this. America wants Syria with Assad; Syria with Assad must also be recognized by countries in the region. Russia and Iran are already content with this, but Turkey is the only country that remains. So, Turkey has declared openly that the cruel Syrian regime is a legal government by speaking about the Adana Agreement. Otherwise, the Syrian regime will not prohibit YPG’s activities within the frame of the Adana Agreement, or it will not hand over its militants to Turkey, because USA itself supports YPG over there. Could such a thing be expected from the Syrian regime without USA’s approval? Let alone that the Syrian regime is a loyal pro-American regime, and Turkey follows a policy within USA’s framework of politics regarding the Syrian issue.